In the morning, Gerhard drops me at Cape Town airport early so I have plenty of time to relax in the BA lounge and do battle with Comair’s proxy servers which in addition to blocking almost all internet traffic, are even smart enough to block you googling for proxy avoidance sites! After an uneventful flight I’m in Jo’berg Airport. I am mighty tempted to head across to the international departures area to enquire how much a ticket to Botswana will cost if I buy it now, but when I realise this involves a trek through a multi-story car park (lots of construction on pre-2010) I give up and accept my fate! My bus is at 2pm from the main bus depot which is next to Park Station in downtown Joberg. All guide books and advice all have extreme warnings about how unsafe this area is, being plagued with violent crime and muggings, so I’m very keep to minimise my time there. My cunning plan is therefore to wait at the airport until 1 hour before the bus departs, then cab it there and hope I don’t die. In the mean time, I pop into Ocean Basket, the seafood chain restaurant, for some tasty hangklip, calamari and salad, washed down with Two Oceans wine. Back at the official airport taxi stand, the price suspiciously seems to have gone up from 220 to 250, so the guy doesn’t get a tip. He says it’s safer round the station now, as there is lots of security, which relaxed me slightly (alert levels down from nuclear to maximum). When we arrive, I don’t like it – a multi-level concrete area with lots of people milling about. A fat porter woman comes over with a trolley and when I refuse her services, suggests I don’t want to tip her. Well, yes. Inside feels much safer than the drop zone – it’s bright, and there are a few security people about. I find the Intercape departure area and join the queue. There seem to be lots of UCT (University of Cape Town) students on their way home, and I chat with Khumo, who has just finished five years of psychology and is just in front of me with an impressive stack of bags. We end up sat on the bus together, and I have to say having had large chaps sleeping on my shoulder for the last few long distance buses I’ve taken, pretty Khumo is a welcome change. Not that I had her sleeping on my shoulder though! It’s quite warm on the bus, and Garam’s fan gets deployed again, yes it’s still going. We chat along the way, and get no sleep, which was our shared plan for this bus. It stops off occasionally, and is running behind schedule. Strangely, the weather seems to get cooler as we head to Botswana. Don’t worry, Khumo assures me, it will be hot in Botswana. We chat about our love for Cape Town. She might go back for her graduation ball in December. When we reach the border, which strangely involved a long stretch of unlit road, we have to alight. The procedure is first SA Emigration, which is easy, just a quick exit stamp. Then we walk across a gravel open area dodging HGVs driving around us to the Botswanan side. Here it’s not so clear what to do. First one has to ask for a form, which involves pushing to the front of the queue, interrupting what the official is doing and asking for it. Why don’t they leave a stack out? Anyway, you fill this in, queue up, and get stamped. The lady asks me what I’m doing in Botswana. Erm, well, not sure really. Why do I always feel like I’ve committed a crime when asked questions like this by an official?! Outside, it’s customs time, and my book says they’re pretty strict in Botswana, often washing your shoes to make sure Foot and Mouth is kept out of the country. We don’t get this, but it’s not clear what we are supposed to be doing. The bus pulls up, and someone says we all have to take our luggage out. Someone else says we don’t. The bags are tightly loaded into the undercarriage by people at the bus terminal in Jo’berg, it’s going to be a mess if we all pull them out. We start doing this, but when half or so have taken their bags and walked through the customs gate, a bus person says we don’t need to do it any more. Eh? A cow wanders about on the grass in front of the customs point, and a UCT student says you know you’re back in Botswana when cows are wandering the roads. Khumo is told she can’t get off the bus in the suburbs, and so we all head right into town, where we are dropped next to a petrol station somewhere. I don’t really have my bearings, but am planning to walk to the Gaborone Hotel, a couple of km away. Khumo thinks it’s a bad idea. After dispatching her and her “everything but the kitchen sink” bags to her sister’s place, I walk round to the petrol station and ask a few more people about the merits of walking. They all suggest it’s not sensible, which is a shame, as my book had said Gaborone was much safer than SA. The decision is made when a taxi driver, Victor, tells me beware of Tsotsi. I’ve seen that movie. I’ll take a cab. He stops just round the corner and I use a Barclays ATM to pull out stacks of money. The hotel we arrive at is a bit run down. I have a room for 270 Pula. The exchange rate is 12 pula to the pound, a nice mathematical change from 14 to the pound for SA and China, and 15 for HK. Anyway, this is pretty expensive, and I won’t stay here long, but it’s good for the first night as it’s very central, and I can walk to the British embassy tomorrow. As we drive there, Victor tells me the difference between muggings here and in SA is that they don’t stab you here. Good to know. I ask the hotel if there is anywhere to eat. It’s 10pm now – they say that the restaurant will serve me if I go straight through there, as they’re closing. I order pap and stew, the most traditional Botswanan fare, but the chef comes out to say they’re out of pap, can they substitute it for chips. Okay! Pap is like sticky cous-cous dough, made from maize. The stew, when it comes, it just an enormous pile of shredded meat. Still, it tastes good. Whilst having this, and enjoying a St. Louis beer, which turned out to be light and rather flavourless, a tipsy chap at the bar joins me in conversation. And very quickly I discover that he knows Thabiso Nasha, a school friend who I was hoping to find here. He calls him on his phone and hands it to me. Hello Thabiso!! What a crazy coincidence, that the first person I meet knows Thabiso. Then again, he is quite famous, presenting a national radio show, and having presented on television too. On the phone, Thabiso sounds just as happy go lucky as he always was, and tells me he’s getting engaged. The waitress, Janet, serving me seems disappointed when I relay this information. I agree to get in touch with him the following day once I have a local SIM. Job and food done, I retire to my room for a good sleep. Next day, I’m up early, and pay for another night in this hotel – would be a pain to move today given that I’m busy. First stop, a mobile phone shop round the corner. I pick up an Orange SIM for P20. Only later do I find out how bad the Orange network is here. Apparently they're doing some sort of upgrade, which means you generally have to try calling people ten times before you get through, which starts to get annoying. They also say that international SMSes are a bit hit and miss. I bet they still manage to charge for every one though. Next, to find the British Embassy. I walk along, and everywhere people smile and say hello. This is exactly what I’ve been missing in South Africa. People are so laid back and friendly here. I love it! Over the railway bridge, and then I get slightly lost, but am soon put right by locals, and it is with some surprise and amusement that I realise that we were dropped by Intercape literally at the back of the British Embassy the previous night. Inside, I confirm that it’s still shockingly expensive, the equivalent of about 120 UK pounds. They are willing to waive the countersignature of photo requirement as it’s a renewal and I don’t know anyone locally (little white lie as I don’t know when I’ll be meeting Thabiso), which is a much more sensible approach than South Africa where they told me to ask my hostel to sign the photo! “I hereby confirm that I have known this person since he checked in this morning”?! How ridiculous! And it will take 10 working days, so will in theory be ready on the 4th December. What a waste of time, but better than the 10 weeks SA is taking. I’m very impressed with the girl behind reception, who is exceedingly well-spoken. Must be Cheltenham! Whilst waiting for 10:30, the time that they do passport applications (until then it’s visa time), I wander the mall, the main centre street of Gaborone. It’s not very inspiring, reminding me of Herne Bay or Faversham twenty years ago! There are run-down discount stores, several fast food venues, and lots of loan-shark shops. The book shop is badly stocked, and when I ask a chap who does some digital photos for me whether there are any good coffee shops around, he directs me to KFC!!! The reason, I suspect, is that most of the action here is in large shopping malls which are all slightly out of town. Kgale (pronounced Kali) and Riverwalk are two of the largest, which I’ll probably be spending a fair bit of time ambling about in over the next two weeks! 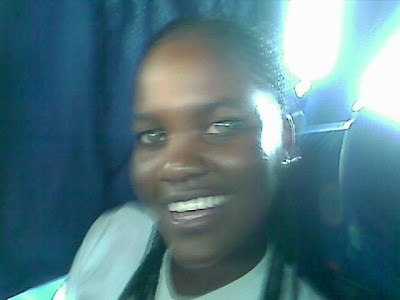 In the afternoon I meet Khumo who is going home to Francistown on the bus. As Gaborone Hotel is next to the bus terminal, I send her off, though I am beginning to suspect I am just a cheap porter, hehe! Just after she leaves, Thabiso calls me, he’s free to meet later in the afternoon. Marvellous! First impressions of Botswana: beautiful friendly people, hot hot hot, nothing much to do but relax, and little for tourists except the reserves, especially in the north. Thabiso picks me up a little late, African time. He hasn’t changed much since school. A few tufty bits around the chin perhaps. Still an enormous big grin! We head out to his car. He drives round the corner to the Mall, and takes me to a bar for a quick beer. It’s just above where I was earlier, but I’d never realise it was there, being a couple of floors up. He tells me Botswana only has a population of 1.6 million people – I hadn’t realised it was so small. He tells me what he’s been up to since school – he came back to Botswana, did Accountancy at Uni, where he got into radio, which is his love. He’s done some television work too, and now is back into radio, but also promotion and consultancy. Next we pop back to his place, where his dogs try quite hard to eat me – picture Thabiso holding me close as we cross his front yard, him spinning round me to push the dogs back. The Rottweiler gets very close to enjoying a chunk of my backside. He has a high electric fence, having had some security trouble before. I meet a friend of his, and his fiancée. She’s beautiful, and playful too. As Thabiso jokes that he’s invited several Miss Botswanas along this weekend, apparently I say the wrong thing when I ask whether it’s an engagement party or a bachelor party! Anyway, she stays, whilst Thabiso and I head out to a function he’s been invited to. It’s at 25 Degrees, a restaurant in my book, though it’s presumably changed ownership since my LP was published. It’s an interesting do – the owner, Mr Sharma, from Hyderabad in India, has invited several media types, including Thabiso, along to introduce them all to his restaurant, in the hope they will promote it. They’re also planning a Mongolian Night, which various people round the table have been advising on (not that any of us except the chef know much about Mongolia!). He provides plenty of food, some of which Thabiso is rather disdainful of, being not particularly keen on spicy food. Where’s me pap n’ stew? And the drinks keep flowing too, most of the large round table on cocktails, me sticking to Peroni. The guys attending are all friendly and nice, friends or colleagues of Thabiso. One produces a restaurant magazine. I offer my services as London correspondent. KK sitting next to me is interesting, especially after he has a flaming sambuca drink through a straw as the waiter pours four different shots into the glass. The food is tasty, from papads, pakora, satay sticks, and then various curries, rice and naan breads. It’s nice, and flavoured but not too spicy. We take a final beer at another place in Riverwalk Mall before heading home. Thabiso seems to know every table in the whole place. He’s got lots of plans over the next couple of weeks, and will take me along to some of it, which is fabulous – we had spoken earlier about the best tourism being with someone local, and going with the flow rather than sticking to the sights section of your guide book. Not that there’s much in the sights page in LP for Gabs – there’s one art gallery. That’s it! Khumo also will come down for the weekend, which will be nice. At the hotel when he drops me, I meet Janet, who was serving me yesterday, she’s waiting for a cab home. She tells me that tomorrow night, Wednesday, is ladies night in Gabs. I suppose I won’t be able to go out then, never mind, I’ll stay in bed with a good book! Speaking of, I am making progress with Tilman, I can’t wait until I post this book home, it must weigh about 2kg! Marvellous read though, and I commend anything written by HW Tilman to you once again!